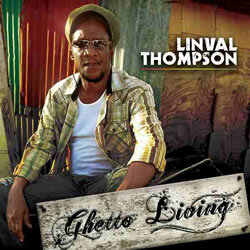 (November 28, 2008 , Miami, Florida) – On December 23rd, foundation reggae artist and producer Linval Thompson unveils his long awaited roots album, Ghetto Living, through I-Tunes on his Thompson Sound Jamaica label in cooperation with Zojak World Wide, the leader in digital distribution of reggae music. Ghetto Living will be available worldwide through all other online vendors starting January 15th. Ghetto Living fuses Linval’s bittersweet sufferah’s sound with powerful social commentary voiced over live rhythm production from Handcart Band as well as modern roots riddims courtesy of Phillip ‘Fattis’ Burrell of Xterminator Productions, and Dubmatix.